Sold by Pritam Music Pvt. Ltd. (4.8 out of 5 | 1,782 ratings) and Fulfilled by Amazon. 5.0 out of 5 starsSome clarifications on this awesome Transformers 2 DVD...! - The "base version" of the Transformers 2 movie was released in 2.4:1 screen format. What this means is that similar to most recent "blockbuster" movies, the image retains large black bars on the top and bottom of the screen, even on widescreen HDTVs, which have a top-to-side screen ratio of 16:9 (or 1.78:1 if you reduce the fraction). These movies aren't designed to fill the screen on a regular HDTV (kind of annoying). - This "Big Screen Edition" of Transformers 2 tries something only done once before on either DVD or Blu-Ray releases (Dark Knight) - about 10 minutes of the movie was actually shot using super-resolution IMAX film stock, so those original images are captured on 1.33:1 (i.e. 4:3, the old almost-square TV top-to-side ratio), then cropped to only use a portion of that for the original release. For major scenes in this DVD, however, a larger portion of the IMAX film was used, enough to completely fill a 1.78:1 HDTV widescreen. These "Big Screen" images are larger, show more information (from the IMAX film stock) and are superior resolution in any format. So if you're watching on a standard HDTV screen, the black bars vanish and the entire HDTV screen is used, with even more detail than you would see in the regular 2.4:1 image. The end result is SPECTACULAR. The images are bigger, sharper, more vivid, and completely fill up your HDTV screen, without black bars. My only wish is that they would have included MORE of these IMAX scenes, not only the major fight scenes. Still, there are simply no other movies like this today (Dark Knight had quality problems) - it's a GEM, a showcase for your home theater, and a substantially improved experience when watching the movie. Highly, highly recommended, and the quality improvement is noticeable on any DVD, in any Home Theater, regardless of the system. And they're rare - trust me, you're friends don't have this, and will be wow'ed by it when you show them. And while the Blu-Ray is better, this is still a killer feature on the regular DVD version (which I have). My bad feedback is about the delivery. 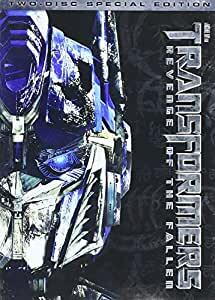 I bought both Transformers and Transformers: Revenge of the Fallen and they both were damaged. The package was not damaged in any way and the other 5 movies that came with them were all good. The snap holder that holds the discs in the case was completely broken and both discs were sliding in the case and getting all scratched up. I had to return them both for a refund. 4.0 out of 5 starsSci Fi Action with Comic Relief. I've like the entire series including the cartoons. This movie again like the first starts with action and builds from there. They comedy aspect of it is also very well timed and works well within the movie as well. All I have to say is watch out for "The Twins". Enjoy the ride. Again another movie worth watching repeatedly. I originally bought this for my son but still remain a huge fan of Transformers. Part 2 is very entertaining and incredibly captivating. These characters have been around for almost 30 years and still going. In short, great movie, entertaining and made me laugh and cry. My son, however, was thoroughly thrilled with every scene. the transformers movies are all pretty good and this movie is no exception. If you have seen one then you must see the others, collect them all for the whole set, action packed and adventurous enough to watch more than once. great for young boys.